While Violaine went to Dumaguete and Siquijor, I went to Mindanao. Mindanao, the second biggest island in the Philippines, located in its most southern part, is sadly known by tourists as the island facing a civil war in its western part. For decades, governmental forces and armed Islamic activists have been fighting about the independance of this western region. Mindanao has thus been avoided by international tourists. Yet, all the eastern part is safe and numerous wonders are waiting to be explored. First stop in Mindanao, Cagayan de Oro and its eco-cultural village called Gardens of Malasag. Cited in a major study on sustainable tourism in the Philippines, my expectations were high. This ecovillage is presented as “a showcase of Northern Mindanao’s ecology and rich ethnic heritage”. 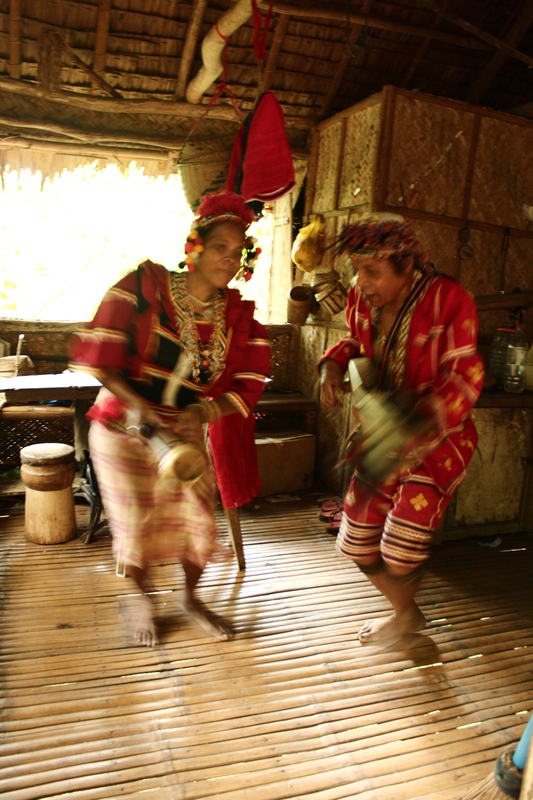 The 55 employees are from these indigenous tribes and some of them wear the traditional clothes and do dance and music’s performances while visitors can discover the traditional huts. This place has some great potential: built on the mountain above Cagayan de Oro, with a unique view on the ocean and the other mountains and volcanoes nearby, this place is truly beautiful. And it has been built in a 7has reforested area, part of a 1,000has forest managed by the Department of Environment and Natural Resources (DENR). The Gardens of Malasag, created in 1996 by the Department of Tourism (DOT) and in collaboration with the DENR, has a kind of micro-zoo with macaques, eagles, iguanes et some other species. Originally, it was aimed to be a rehabilitation area for the endangered species with a goal to release them afterwards. But in 2001, the Tourism Infrastructure and Enterprise Zone Authority (TIEZA) became the owner and manager of the ecovillage. TIEZA, a governmental agency linked to the DOT, seems to be more business-oriented than the DOT. And in this ecovillage, business has taken over nature and culture. 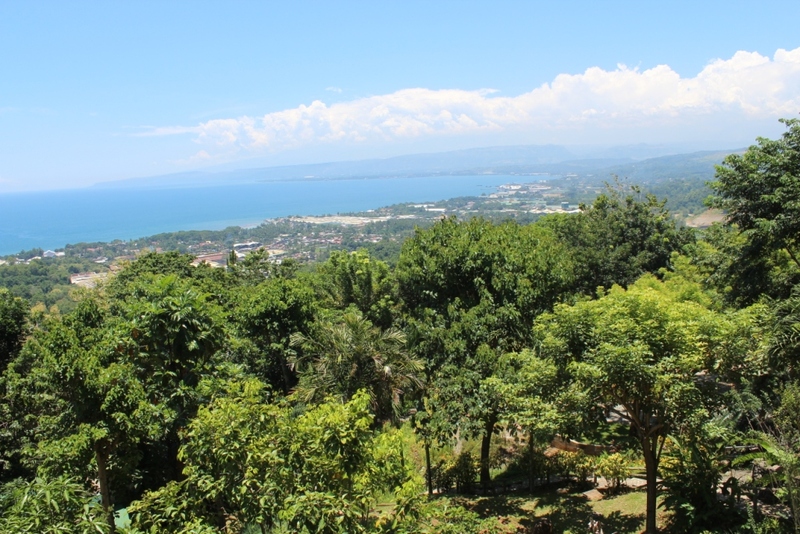 In order to leverage the potential of the parc, to generate additional revenues to make this place sustainable and to decrease the financial dependence, different hotel infrastructures were built in the Gardens of Malasag. 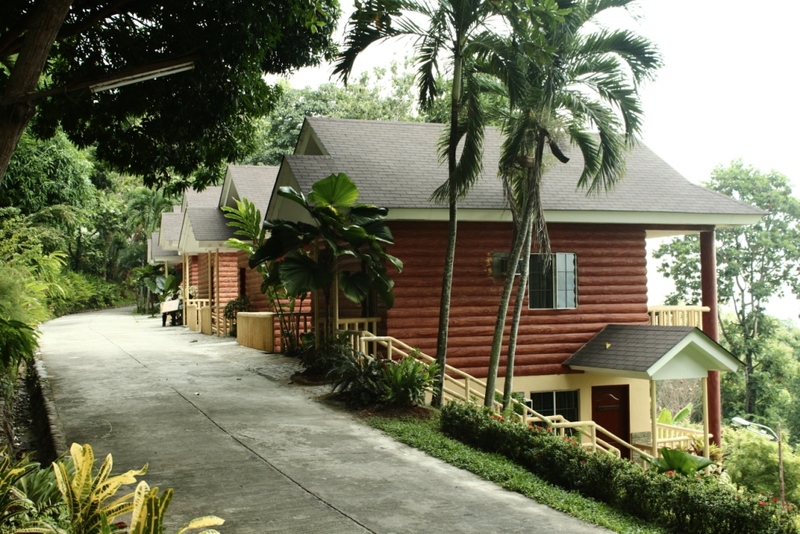 Cottages and dormitories were built for a capacity of 150 people. A swimming pool, two seminar halls, an amphiteather, a restaurant with its breathtaking view, a campground, a miniature canopy walk and massage area were developed. Everything made with bitumen. While I walk on the small road (with concrete too) between palm trees, travellers palms and other species of plants, I feel kind of upset facing all this buildings, these roads, this swimming pool while we are in an ecovillage and where traditional Filipino houses are made of wood. I continue on the road and look for the fauna rehabilitation area. I’m facing it now: tiny rusted cages with a dozen of macaques inside. 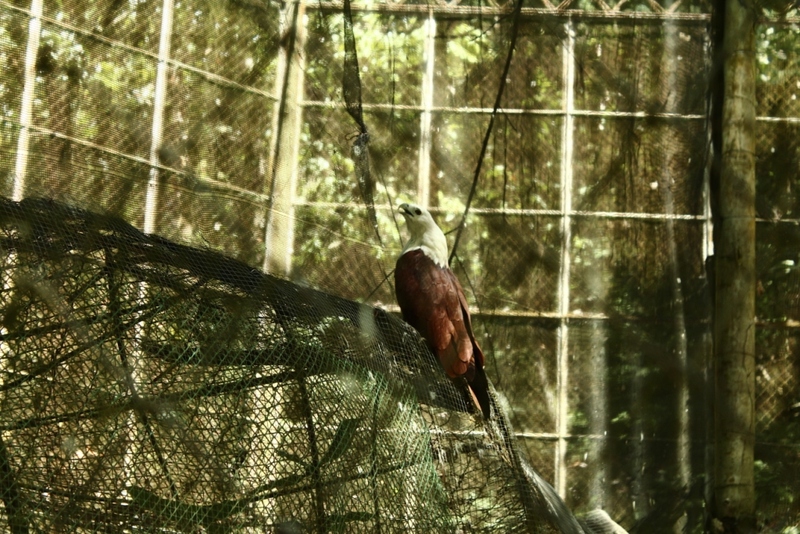 Besides, the bird cage with 2 eagles inside including the Brahminy Kite : a sharp look, a white plumage from the head to the neck and a brown-red plumage on the rest of the body. But these eagles are kept in 3m3 with a net preventing them to fly. I feel really upset, revolted. It is an ecovillage, thus an ecological village, which should be a tribute to fauna and flora, a pride in this region. 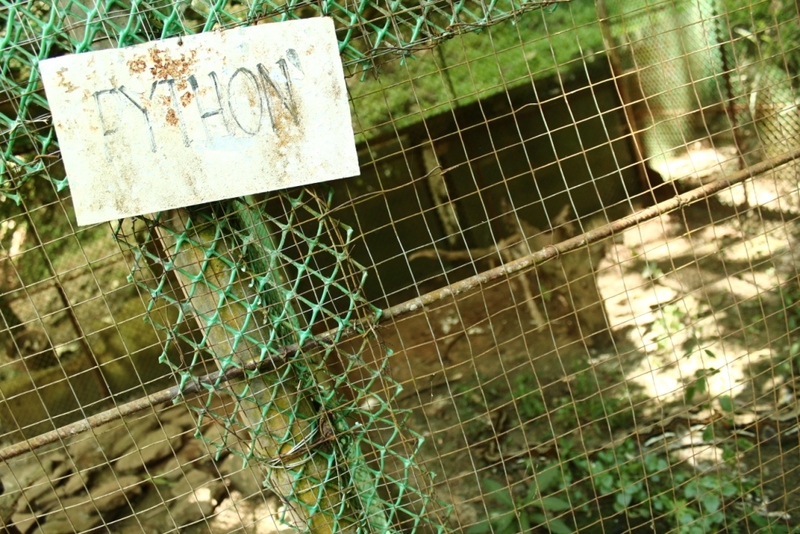 But animals are kept in tiny cages (the python cannot spread its body). Endangered species which should be rehabilitated in cooperation with the DENR, are just left aside. And the traditional huts which are supposed to showcase the rich ethnic heritage are not well conserved. And all these concerns are just forgotten for the development of new seminar halls and cottages. The executive director of the Gardens of Malasag is honest to me. She is not hiding these facts and explains that most of the visitors (around 30,000 last year) come for governmental or corporate seminars. Moreover, she revealed that the TIEZA policy even before she arrived in 2004 was set: “transforming the ecovillage in a mountain resort, for seminar purposes”. I asked if she cannot improve or change anything about these matters but tells me that the ecovillage is not profitable. It has not enough resources and she is under control of the central TIEZA agency in Manila. She says that she feels quite ashamed about the animals in the parc but she cannot release them, and the DENR which should take care of them also does not care. Concerning the cultural side of the ecovillage and the showcase of indigenous cultures, another “discomfort” appeared to me. The members of the tribes are employed to dance, play music and wear traditional attires all day long which I feel as a kind of “cultural prostitution” with the parents playing Koglong (traditional guitar) in their huts while asking their child to dance in front of the visitors. Yet, the families are really friendly and hospitable, easy to talk with, inviting people to take pictures without asking money in return, not like in the rice terraces of Banaue. Therefore, during the interview with Cerelina Chan, the director of the Gardens of Malasag, I was able to discover the issues in this ecotourism initiative: first, they kind of forgot or stop to pursue the original mission and vision of creating an eco-cultural experience highlighting the natural diversity and rich ethnic heritage of North Mindanao. This loss of going to the original cape is mainly due to the change in governance (from DOT to TIEZA) thus in policy. 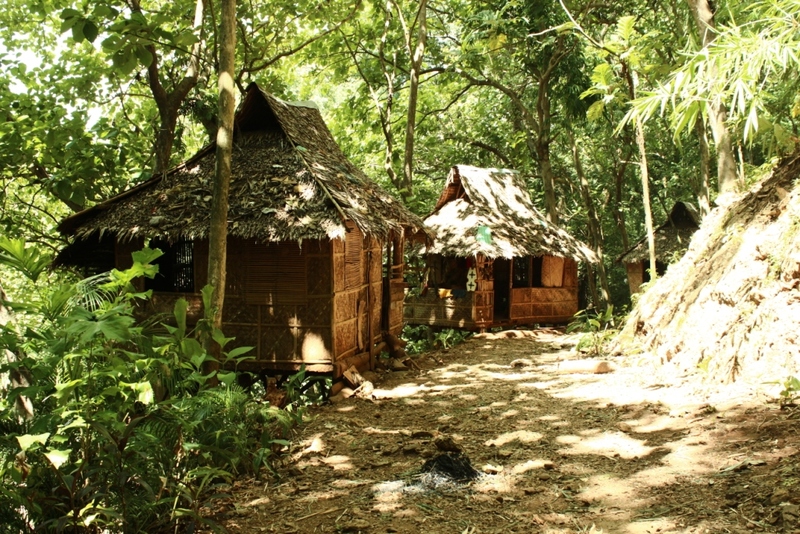 Associated with this change of management, the centralized governance from Manila, more profit-driven, prevented the ecovillage’s director and staff to manage their own way. Finally, in term of eco-cultural experience, there is a significant gap in the interpretation part of the experience, thus in the environmental and cultural education of the visitors: animals should be better treated with bigger cages. Explanation boards should present the different fauna and flora species, their particular characteristics and remarkable facts and the rehabilitation mission should be implemented again. And concerning the indigenous tribes, huts should be well preserved, different traditional objects should be exhibited as well as photos, videos of cultural shows and rituals, recordings of traditional songs or paintings representing the daily-life or the past traditional life. Hi. tell me, how can we get to this place? Is there an entrance fee?